Few know that world hunger was very nearly eradicated in our lifetimes. In the past five years, however, widespread starvation has suddenly reappeared, and chronic hunger is a major issue on every continent. In an extensive investigation of this disturbing shift, Jean Ziegler—one of the world’s leading food experts—lays out in clear and accessible terms the complex global causes of the new hunger crisis. Ziegler’s wide-ranging and fascinating examination focuses on how the new sustainable revolution in energy production has diverted millions of acres of corn, soy, wheat, and other grain crops from food to fuel. The results, he shows, have been sudden and startling, with declining food reserves sending prices to record highs and a new global commodities market in ethanol and other biofuels gobbling up arable lands in nearly every continent on earth. 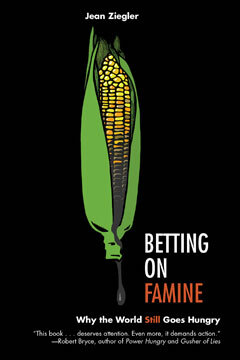 Betting on Famine will enlighten the millions of Americans concerned about the politics of food at home—and about the forces that prevent us from feeding the world’s children.